Cover art: Tommy Arnold. Courtesy of Tor.com Publishing. 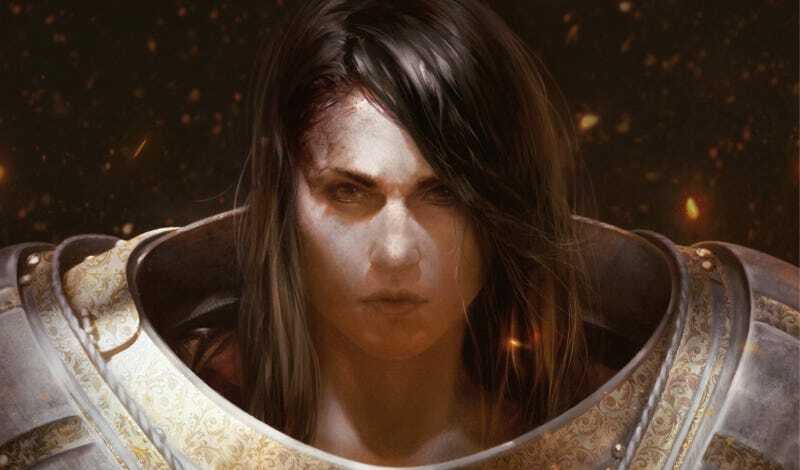 In the suspenseful first chapter of The Armored Saint, the first in author Myke Cole’s new Sacred Throne epic fantasy series, we get a good sense of why the Order, who are sadistically fond of striking down the humble people they claim to protect, are such a source of dread. And we also get some foreshadowing that smart, curious Heloise—already tired of cowering from men empowered by a supernatural threat she’s not even sure really exists—will spark a long-overdue rebellion in the near future. From father to son, from mother to daughter, until your seed is dust. My redemption is the Emperor. My hope is His outstretched hand. Suffer no wizard to live. The warm roughness of his palm made her feel safe, but she only smiled up at him, shrugged. She didn’t want to hear that something frightened him now. She wanted Samson the father and protector, not Samson the friend. Her father was a big man, and if his hair had gone gray and his stomach drooped over his belt, he more than made up for it with his broad shoulders and thick hands. For all his talk of being frightened, Samson’s eyes were hard, “Serjeant’s eyes,” the village Maior called them. He had fought alongside her father in the Old War. Don’t let his factor’s hands fool you, Heloise. Your father was a shield-hewer, the strongest pikeman I’ve ever known. The very name Samson struck terror into the hearts of the Emperor’s enemies. Samson stopped, glanced over his shoulder. Heloise turned. Dust was rising on the road behind them, billowing out behind a column of riders. Too many to be bandits, even if they were brave enough to risk the Order’s main road. Heloise heard jangling chains and looked for a cart, but couldn’t see one. The dust whirled and cleared to reveal Pilgrims, their gray cloaks flapping away from leather armor, flails held out before them. At their head rode a Sojourner. His cloak was edged with gold, the bright red fabric so clean it shone, as if the dust dare not touch him. The Sojourner held his flail across his chest, head over one shoulder, black iron spikes nestled against the scarlet fabric of his cloak. The red meant he had completed the great Sojourn, a year on the road to visit the sites where the Emperor had fought the devils until they were pushed back into hell. The Pilgrims’ gray marked them as lesser men who’d done only the fortnight-long Pilgrimage. They were pale imitations of their leader, their cloaks simple. Only their flails were equal: the same stout, well-oiled wood. The same sturdy, black length of chain. The Order had arrived, as if talk of them had made them appear. The terror was as intense as it was sudden. She obeyed him, closing her mouth and casting her eyes to the ground. The cool air felt suddenly hot, the wide sky pressing down on them. The hoofbeats came closer, and with them, the sound of the jangling chains. “Bow your head, girl, now!” Samson hissed. The hoofbeats seemed to continue endlessly. The sound of the chains rose as they drew closer. Heloise could see the links playing out behind the horses, dragging in the dirt. A dead woman slid past Heloise, green and bloated, caked with road filth. She was wrapped in the long, gray ropes of her innards, tangled in the metal links until Heloise couldn’t tell her guts from the chains. The horses dragged another body beside her, wrapped in metal like a silkworm in molt. Heloise’s gorge rose at the stink and she gagged, clapping a hand to her mouth. Another moment and they would be past. Please don’t notice us. Please ride on. The jangling ceased as the riders halted. Heloise couldn’t resist glancing up. The Sojourner had a narrow face and a smile that was somehow worse than a scowl. He slowly turned his horse, a black animal taller and broader than any Heloise had ever seen. Heloise felt fear climb her spine, followed by anger at him for making her afraid. Without lifting his eyes, Samson handed the satchel over. The Pilgrim fumbled with the iron buckle before cursing and ripping it open, sending a popped rivet flying. He thrust one gauntleted hand inside and seized a handful of her father’s pens, tossed them into the mud. One of the inkpots followed. Heloise’s mind whirled, calculating the cost of the precious items, figuring how they could be repaired. It wasn’t so bad. The pens were wood and metal. Some had fine tips, but provided she was careful when she cleaned them, they wouldn’t be damaged. She winced as the inkpot struck the wet mud, but she didn’t think it had cracked. So long as he didn’t throw out any of the . . . The Pilgrim’s hand disappeared back into the satchel, emerged with a handful of crumpled paper. Heloise was only able to half-stifle a cry as he tossed the precious sheets in the air. They drifted in the wind, made their way down toward the wet mud. Before Heloise knew what she was doing, she had taken a long, lunging step, her hand lashing out to grasp at the falling paper. The sudden move stirred the wind, and the precious sheets danced away from her, floating sideways and down, always down, until the ground snatched them up. Heloise chased them, knowing it was useless, unable to stop herself, eyes locked on the slowly spreading stain that was wet mud hungrily devouring the tools of her trade. Even now, Heloise had to fight not to bend down and pick the paper up. He only threw out some of it, she told herself. It’s not all ruined. The thought helped her to be still. Heloise glanced back at the bodies. She knew she should answer, but she was robbed of speech, first by fear, then by rage. The Sojourner’s smile slowly faded as he waited. Her father’s elbow in her ribs once more, almost knocking her over. “Your eminence,” Heloise added again. Heloise looked sideways at her father, but his eyes were on the ground, his jaw clenched. Heloise looked back to the corpse. The dead woman’s tongue had swollen out of her mouth, fat and gray. The moment dragged on. The Sojourner had asked her a question, she had to answer. “Yes, Holy Father.” Brother Tone turned his horse, throwing the satchel over his shoulder as he went. Heloise watched it turn end over end, the lid flapping open, the remaining papers threatening to fall out. She could see the wind plucking at them, ready to cast them down to join their comrades in the ruinous mud. She felt herself start to cry then, because it was the rest of what they had, because she knew that most of their earnings for the next season would have to go to replenish their supply, because . . .
She heard a dull thud, felt something soft strike her hands. Her father’s eyes widened and the remains of the Sojourner’s smile vanished. “Perhaps you do not understand what the Holy Writ means by ‘obedience.’” The Sojourner’s voice was cold. His spurs jingled as he touched them to his horse and the animal took a step toward her. Brother Tone twitched the reins and pulled his horse between Samson and the Sojourner. “Holy Brother, there’s no—” Samson began. Heloise reached for her father, but he placed a broad hand on her belly, shoving her back. With the other, he reached up to his right eye, prying it wide open with thumb and forefinger. Tone looked for a long time. At last he sat back, turned to his master, nodded. “Yes, Holy Brother.” The relief in Samson’s voice made Heloise angry and sad at the same time. “Yes, Holy Brother,” Samson said again, but it was lost in the pounding of hoofbeats, the jangling of chains, and the rising dust as the riders started moving again. Heloise and Samson stood, silent and frozen, as the whole column trundled into the distance, until at last they turned with the road and moved out of sight. Samson didn’t take his hand from Heloise until the hoofbeats had faded into the distance. Heloise glared after them. “I’m sorry, Papa,” she said again, “I don’t know why I did it, I just . . . but paper is so costly and I thought that . . . he was finished with it . . .” The fear and the humiliation swirled in her mind and her gut, so intense that she almost missed a third, stronger emotion, boiling beneath it all. Rage. Fury at the Order for making her father grovel while they destroyed the tools of his trade. They cleaned the mud off the pens as best they could. The inkpot was whole, if a bit dirty. The paper was so thoroughly soaked that it was hard to distinguish from the mud, and they left it where it lay, walking on in silence. Her father was right. She had risked both of their lives. As Heloise considered it, the anger turned from the Order to herself. “Yes, Papa,” Heloise said, but she could hear the shame in her voice. Heloise did her best, trying to feel the warmth of the sun on her face the rest of the way to Hammersdown, but the sour feeling stayed in her stomach, and her father’s kindness made her feel even worse. She almost wished he’d shout at her, tell her she was a fool who could have gotten them both killed. She opened her mouth to apologize again when she heard shouts. Growing louder. “It sounds like Churic,” Heloise said. Churic’s voice grew louder as they walked past Hammersdown’s sentry tower. Heloise heard other voices now, Jaran Trapper, and Bertal Fletcher, too. Alna Shepherd stood at the common’s far end. His dog, Callie, had rounded the sheep into a tight circle. She stood in front of them, a low growl in her throat, until Alna’s daughter Austre patted the dog into silence. Jaran stood beside Bertal. The two were nearly identical, lined faces nearly hidden behind thick gray beards. Jaran was distinguished only by his gold chain of office, marking him as Maior. Both men were bent over Churic, red-faced and shouting. Samson let go of Heloise’s hand. She fought the urge to reach for his again. Bertal smiled so broadly, it looked like his cheeks hurt. He glanced nervously at Churic. “Of course all’s well! Why don’t we head to my shop and get to business, eh? Marda’s made some meat pies.” Samson’s eyes stayed on Churic. There was spit on the simpleton’s lips now, white and foaming. “Oh,” Austre said. “Well, maybe she can come later?” Heloise was happy to see her, and felt a stab of disappointment at missing the chance to run Callie through the tall grasses on the common, but the pall of fear that hung over the village made it short lived. “What in the shadow of the Throne is this?” Samson’s eyes went hard. “It’s nothing!” Bertal said. “Mad ravings, is all. You know old Churic.” The fletcher laughed. Heloise thought it sounded more like a scream. “Don’t hurt him!” Heloise started forward, but Samson grabbed her collar, pulling her back. “I’ll not do business today,” Samson grunted. “Papa,” Heloise began, thinking of the paper they’d lost to the mud. “He’s a madman!” Jaran let Churic draw another breath, tightened his grip again before he could speak. “You don’t have to choke him!” Heloise said, struggling, her father’s big hand holding her fast. Samson turned and dragged Heloise so hard that she had to take great, leaping steps to keep up with him. Callie set to barking, a steady, accusing stream that followed them out to the trail home. Heloise was quiet for a long time, anger at the injustice warring with her fear of the look on her father’s face. Samson only shook his head, the fury in his eyes fading to sadness. “Then why . . .” Heloise began. She remembered the words of the Writ. This we believe: That the Emperor stood for all mankind during the great battle for the future of the world. That He cast the devils back into hell. That, gravely wounded, He used the last of His life to draw the veil shut between the world and hell, sealing the devils away forever. He died and was reborn as the divine Imperial Soul, immortal, His unblinking eye ever turned on the safety of His empire, on keeping the veil shut. For a thousand years, humanity had known not peace, but life at least, which was more than they could expect should the devils return. But sometimes, they did return. There were men and women who thought themselves above the Imperial Writ, who wanted the wizardry that flowed like water in hell, who were willing to reach beyond the veil to get it. Such people knew great power for a time, but sooner or later, the portal in their eye would open, and they would turn from people into doorways, and the devils would come through. When a wizard was discovered, the Order came to put the matter right. They took no chances. Even talk of wizarding meant there was a chance the veil had been rent. And what was rent, must be Knit. “Are the devils so bad? Have you ever seen one?” Heloise asked. “Then how do we know they’re real?” Heloise asked. There was a part of Heloise’s stomach that churned and whirled, a sick ball deep in her middle. That part could not forget the dead woman’s face, her swollen tongue gray, and cracked lips. That part told Heloise that even though her father’s words made a cruel kind of sense, this wasn’t the way things were supposed to be. So... are those wizards who transform into devil-summoning portals real, or were they invented by a power-mad ruler to keep everyone in line? Or is there a third truth to be revealed? Find out when Myke Cole’s The Armored Saint is out February 20.